The appearance of Stokely CarmichaelStokely Carmichael was a civil rights activist. Initially, Carmichael followed other civil rights leaders and advocated non-violent protests. After he was repeatedly arrested and imprisoned, Carmichael grew disenchanted with the non-violent civil rights protest. He argued that African Americans should denounce white society. Later, Carmichael joined the Black Panther organization, which advocated using violence to achieve equality and civil rights. Carmichael eventually left the United States and moved to West Africa. Carmichael is credited for coining the phrase "black is beautiful." 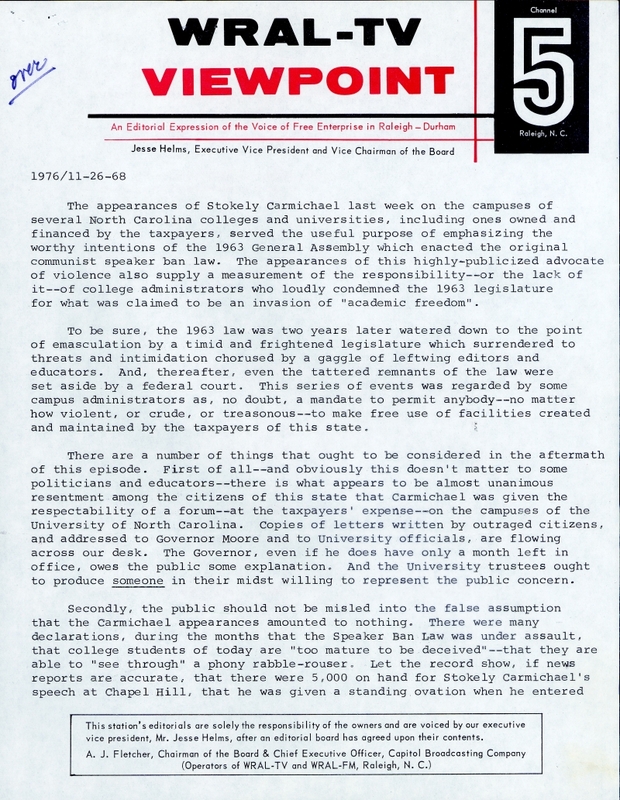 last week on the campuses of several North Carolina colleges and universities, including ones owned and financed by the taxpayers, served the useful purpose of emphasizing the worthy intentions of the 1963 General Assembly which enacted the original communist speaker ban law. The appearances of this highly-publicized advocate of violence also supply a measurement of the responsibility—or the lack of it—of college administrators who loudly condemned the 1963 legislature for what was claimed to be an invasion of "academic freedom." To be sure, the 1963 law was two years later watered down to the point of emasculation by a timid and frightened legislature which surrendered to threats and intimidation chorused by a gaggle of leftwing editors and educators. And, thereafter, even the tattered remnants of the law were set aside by a federal court. This series of events was regarded by some campus administrators as, no doubt, a mandate to permit anybody—no matter how violent, or crude, or treasonous—to make free use of facilities created and maintained by the taxpayers of this state. There are a number of things that ought to be considered in the aftermath of this episode. First of all—and obviously this doesn’t matter to some politicians and educators—there is what appears to be almost unanimous resentment among citizens of this state that Carmichael was given the respectability of a forum—at the taxpayers’ expense—on the campuses of the University of North Carolina. Copies of the letters written by outraged citizens, and addressed to Governor Moore and to University officials, are flowing across our desk. The Governor, even if he does have only a month left in office, owes the public some explanation. And the University trustees ought to produce someone in their midst willing to represent the public concern. Secondly, the public should not be misled into the false assumption that the Carmichael appearances amounted to nothing. There were many declarations, during the months that the Speaker Ban Law was under assault, that college students of today are “too mature to be deceived”—that they are able to “see through” a phony rabble-rouser. Let the record show, if news reports are accurate, that there were 5,000 on hand for Stokely Carmichael’s speech at Chapel Hill, that he was given a standing ovation when he entered the auditorium and this his advocacies of violence and anarchy were interrupted with applause on numerous occasions. And, finally, the recently-elected men and women who will serve in the 1969 General Assembly ought to obtain a copy of the federal court decision that declared the much-battered 1963 Speaker Ban Law unconstitutional. It is important to bear in mind that the court absolutely did not contend that the state has no right to control the type of speakers who appear on campuses which the taxpayers are required to support. The court merely found fault with the language of the 1963 law, which was admittedly drawn in haste and which contained a lack of sophistication of draftsmanship which can easily be improved under circumstances of more time and less pressure. The point is that somebody needs to provide assurance that the state-owned college campuses are not to be continually abused by the negligence, or the fearfulness, or the irresponsibility of administrators willing to permit any muckraking apostle of violence who happens to come along to make use of campus facilities. The Carmichael episode indicates that the college authorities may lack the backbone to do what they ought to do. If this is so, then the state legislature has not only the authority but the duty to step in. Admittedly, the process of screening speakers is not an easy one. But the kind of salaries paid to college administrators does not suggest that they should have easy jobs. Many of them are paid nearly as much as, and sometimes more than, the Governor of this state. The taxpayers have a right to assume that in exchange for this kind of compensation, the administrators will perform in an able, intelligent and courageous manner. Such performances were not evident on some of our campuses last week. Promotional transcript of a televised "Viewpoint" editorial from Jesse Helms of WRAL-TV, November 26, 1968. From the North Carolina Collection (call number C384.5 H48v), Wilson Library, University of North Carolina at Chapel Hill. This excerpt of an editorial written in 1968 addressed concerns of "Black Power" activist Stokely Carmichael apearing at the University of North Carolina at Chapel Hill.